We secure and dispatch your medic. We provide their contact information. We submit an invoice to your production. We built our EMS database one medic at a time. We search by city, state, zip code and certification level. When a production requests a set medic or other emergency personnel, we reach out to the members of our extensive database and other avenues to find the right person for your production. We secure your medic and dispatch them per your call sheet. If the medic calls in sick, we do our best (with great success) to cover the shift. For multiple production days we hire and manage your medical schedule. We handle the payment to the medic, taxes, insurance, medical kits; Everything! We'll send an invoice which includes the medic's daily report. Typically we have a 15-day Net payment but deposits and pay on site may be required for some productions. What is and do you have Medical Malpractice/Liability Insurance? We invoice the production company as an independent contractor. Your invoice will include a daily report from your medic(s). We pay the medics internally and invoice the production based on their daily reports. Copies of our W9, incorporation documents, medical malpractice and workers compensation insurance will be provided upon your request. Do you provide Union Medics? We are not affiliated with IATSE. Our primary clients are non-union. In right-to-work-states, we will accept work for union productions. In such cases we either provide services via invoice or as a "Loan Out"
Check with your executive producer if you are unsure of your productions' union requirements. Live events vary from one medic with a bag to a fleet of medics, tents and off road vehicles. The best "First-Approach" is to send us your wish list; What do you need or what want to see? We don't "hard-sell". We explore reasonable solutions to your needs. Do you have an EMS cart? Do you do Mud Runs? We have the management team, the medical personnel, equipment and supplies necessary to handle your local or nationwide tour. Do you have doctors? Physical therapist? Water Rescue? We have medical control for all our events. We can also provide on-site doctors for events. For marathons and mud runs physical therapist and water rescue personnel can be arranged and provided. Contact us about your production. Once we have your production schedule we will arrange a local medic for each location. You are assigned one phone number and email that way you will have one number/email that will forward to whoever your medic on duty is. No need to change or update your call sheet with new information each location we handle all that from our dispatch center. The ideal situation is to send one of our fully stocked EMS Pelican Cases with your traveling team. That way you have one consistent kit for all locations. Sometimes that is not possible. No worries, most of our medics have their own BLS kits and we provide a suggested list of supplies and over-the-counter medications. Regardless of your situation, we will make sure a medical kit accompanies the medic. Can you provide a medic to travel with us? Often, having one medic to travel with you is the best, ideal situation for your production. We have countless medics nationwide that are able to join your on-the-road crew. Who are some of your past "Traveling" clients? We provided local medics in each location. Each medic would travel with the crew over the various days while on-the-road. We also provided a specially outfitted medical kit hedged toward the kind of injuries or illnesses the cast and crew might face on-the-road. Another few productions that film in multiple locations nationwide. We provide Set-Medics, Fire Rescue crews and Ambulances. Since 2015 we have provided local medics to each of their locations year-round. It's a short private event lasting only a few hours but we save the client countless hours trying to find a medic in each of their locations, negotiating a deal and billing. Another traveling event that takes advantage of our extensive database to provide medics to all their event locations. What is Advance Rescue Services? Typically Critical Care, Combat or Flight Paramedics. All set and event medics work under BLS guidelines regardless of their certification. Upgrading to ALS is an additional service we offer. This requires an additional fee, equipment, medicines and doctor notification. So be sure to give as much time as possible when booking. We provide both lifeguards and water rescue personnel. Lifeguards are primarily a "reach and rescue" skill. They see a struggling swimmer and are capable of reaching them and rescuing them. Water Rescue is the same but may have additional tools and training to "reach and rescue" your patient in the water. We have many medics who are also water rescue certified. Please contact us to help you determine which is appropriate and required by your production insurance requirements. Depending on your production and location we have a variety of highly trained individuals familiar with their area. This may include local medics well versed in swamp environments or armed, bear certified medics in Alaska. We have provided both! When should we consider a Reality Medic™? Anytime you are more than an hour from a hospital. Long durations in remote locations. The chances are high that there will be serious life threatening injuries. Your production needs to handle all but the most serious injuries and illnesses in the field. ... and how is it different from a regular Set Medic? The Reality Medic™ Division is our most advanced service. The paramedics (or higher certified) we send are the most experienced and seasoned professionals in our database. They include both men and women who are accostomed to working in the most challenging and remote locations (Including international). Examples include shows such as Discovery's Naked and Afraid. In addition to more advance equipment and medications, they have 24 hour access to our dedicated medical director. Reality Medics™ are ideal for productions in highly dangerous and extremely remote locations. How do international productions work? Reality Medics travel with your cast and crew. Travel lodging and workers compensation is provided by the production. Your Reality Medic is, for all intended purposes, a member of your crew and given the same treatment and courtesy as any other crew member. Although our medics are essentially part of your crew they still work for and are paid by National Set Medics. Reality Medics are available 24 hours a day for emergencies and are on duty for either a 12 or 24 hour shift. Reality Medics provide American protocols and medicines. When a local doctor is on site, our protocols take precedent over the local doctor for American Crew. The local doctors' protocols take precedent for local cast and crew. Of course, the Reality Medic and local doctor work closely together. Our services can save your production hundreds of thousands of dollars! A minor injury or illness can quickly turn into a serious matter. Bad for the patient and bad for the production. More often than not, our treatments keep a crew or cast member in the field and thus eliminating any downtime to the overall production. More importantly, A Reality Medic is the best of the best. This gives the cast and crew comfort knowing that in an emergency they will be receiving top of the line American treatments and medicines. What's more is that our Reality Medics have a 24/7 direct line to our medical control doctors. In many countries, medicines and medical training is sub-par to American standard. Can your Reality Medics™ be Armed? Some locations have a higher risk of wildlife threats. In such cases, our medics are typically armed to protect themselves, the cast and crew. Do your Reality Medics suture? Administer Antibiotics? Suturing and antibiotics is not a typical treatment done by critical care paramedics in the field but our doctor has included it for experienced medics. Being so far from the closest hospital means our Reality Medics must do more to keep your patient alive in an emergency. We are uniquely equipped to do so. How qualified are your Reality Medics™? A Reality Medic™ is someone who has spent their medical careers perfecting their skill and knowledge; they are in great physical shape, professional and well experienced in remote medical. We typically look for flight medics, critical care medics and combat medics. These Reality Medics™ have performed most if not all paramedic skills reliably in the field; plus many skill not typically done in the ambulance such as Suturing, antibiotic therapy and recognizing medical illnesses early. We get hundreds of submissions for our Reality Medic™ division but only a few qualify. Upgrading to ALS is an additional service fee that requires additional equipment, medicines and doctor notification. The Moto-Rescue division are a select group of medics and non-medics on motorcycles. Moto-Rescue riders patrol your closed-course event and render aid and traffic assistance as necessary. The medical Moto-Rescue riders carry a variety of medical equipment and supplies to handle just about any thing they might pull-up on. 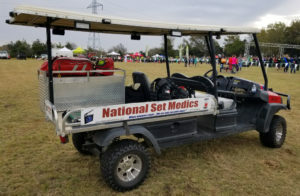 Patrolling your closed-course event for injuries or illness. Medical motorcycles are equipped to perform immediate life threatening emergencies on site. Motorcycles can quickly respond to hard to reach portions of your course. Motorcycle medics can reach and triage a patient much quicker than an ambulance or EMS cart. Motorcycles are less intrusive and more maneuverable than larger vehicles. It is easy to station Motorcycles along problem spots on your course and quickly adjust their coverage as needed. We can be dispatched by your command team or our in-house dispatcher. Moto-Rescue teams are outfitted with 2 way radios and digital maps. Our dispatcher can also monitor the location of our motorcycle units in real time. We have a direct toll free number to our dedicated dispatcher or we can work in conjunction with your command team for reporting. In any case we easily implemented into your command structure and an additional resource.